I’ve been grading these big “Interim Assessment” tests for an eternity, and I’ve gotta say I’m impressed with the work some students did. We spent a lot longer on our qualitative energy unit than I’d intended, but it never felt stale. What we’ve ended up with is a pretty cool little language, spoken mostly through the energy bar charts. They allow us to say things that make real connections to what’s happening in a situation. This example is a favorite of mine. We can see all kinds of variety in this example. Starting with evidence about speed, height, and shape, then inferring Ediss and perhaps Echem from there, we can see details about why a ball bounces higher when you throw it down, etc. Intuitive and not-so-intuitive predictions can be made by simply referring to a sketch of a bar chart. This test was the first time we’d seen a squished rubber ball, and some students figured out that elastic energy must be stored in that squished ball. 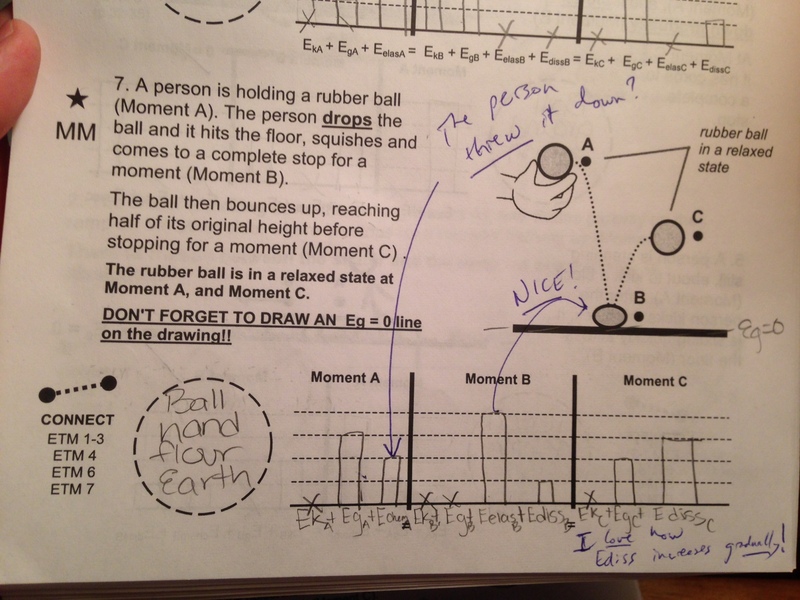 This student has envisioned energy dissipating as a continuous process that happens both before and after “Moment B”. Coming up next week I’ll be giving a two-hour long exam that my school calls an “Interim Assessment.” While this test wouldn’t entirely count as “high-stakes”, I’m not used to giving huge exams, and we’ve done so little content so far this year I was struggling to come up with material that would fill the time. Not least of all, I wasn’t looking forward to grading 135 tests of entirely hand-written material. The first part of each question asks students choose one statement that applies to the work shown (I asked students on a form whether they were comfortable having their work shown.) These are statements from a “Skill Rubric” that applies to that question, and meant to help guide students toward actually reading the rubric in a useful way. 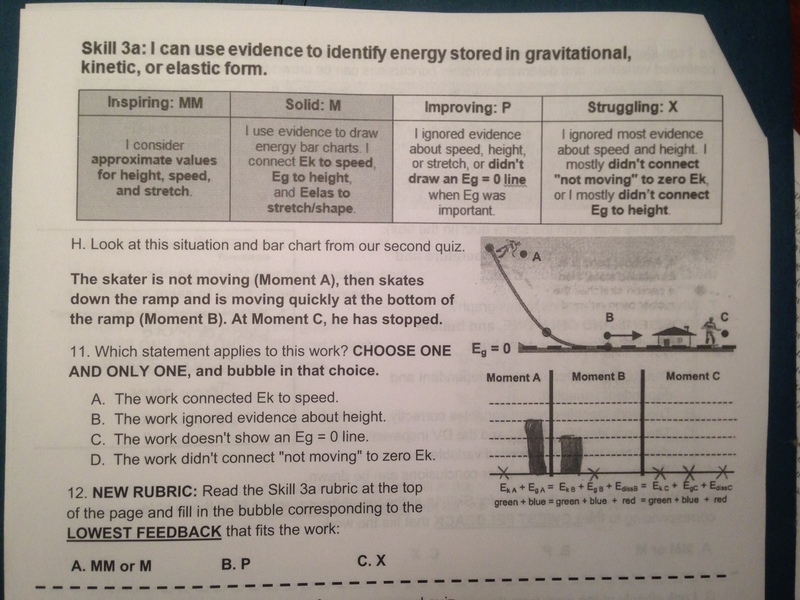 The second part of each question asks them to find the statement they circled in the rubric, and give feedback on the work – MM or M for Inspiring/Solid, P for Improving, and X for Struggling. The really spectacular thing is that it’s finally forcing students to actually parse through what each of the skills mean. 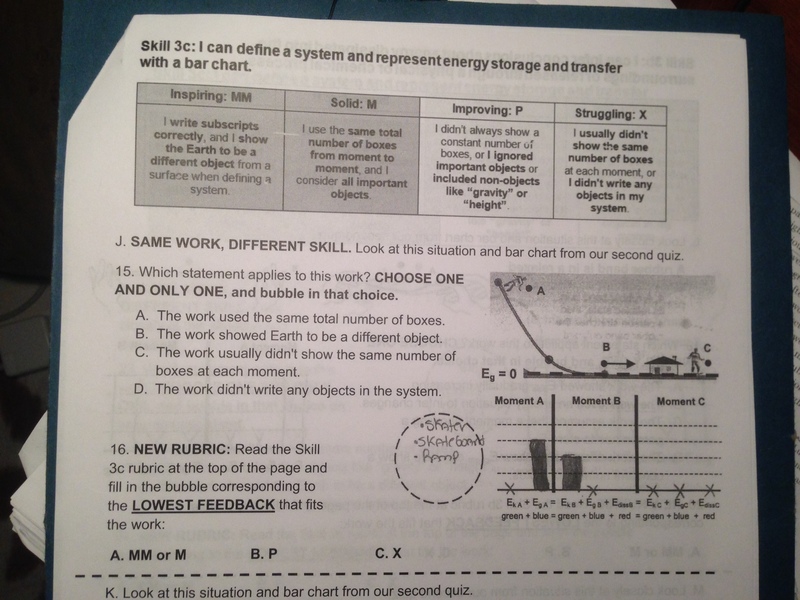 It was a breakthrough for some of them to realize that the same work could get an M on “analyzing evidence” and an X on “bar charts,” since they’re mostly used to thinking if answers as right or wrong… In the question below, I’m asking about “SAME WORK, DIFFERENT SKILL,” to emphasize that there are multiple elements to the feedback their getting. I’ve also noticed a real shift in many students attitude to getting feedback, now that they’re realizing that it’s all about doing better work down the road. Since this big test is yet another opportunity to raise Skill Grades, hopefully these Feedback Questions will help students get into the right mindset! !